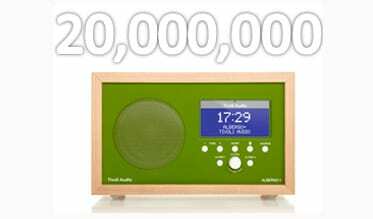 In the final run-up to Christmas it has been announced that cumulative domestic digital radio sales in the UK have now exceeded 20 million. The 10 millionth digital radio was sold in 2010 and took 10 years from launch, while the next 10 million were sold in less than 5 years. GfK has confirmed that domestic digital radio sales (including DAB, Hybrid and IP radios) were 19.8 million to the end of November 2014, with industry analysts projecting further sales of in excess of 300,000 by Christmas Day. In the peak sales period leading up to Christmas Day retailers are reporting good sales of digital radios, and digital radio sets also feature prominently in major seasonal gift guides. There are many new DAB digital radios available at retailers for this Christmas, with prices ranging from about £30 to £300 with many including Bluetooth capability. There’s never been a better time to buy or give a digital radio because DAB coverage is expanding (coverage of BBC national stations is now 95%) and new digital stations are launching all the time. This Christmas has seen the launch of new digital radio stations on DAB such as Smooth Christmas, Kisstory and KissFresh, with the national DAB launches of Smooth Extra and Magic coming in the next two weeks. The Christmas digital radio industry advertising campaign is the biggest ever and features Formula One host and ex-Gadget Show presenter Suzi Perry. The campaign is currently running on over 100 commercial radio and BBC national and local radio stations, with the message that digital radio is the perfect gift and the endline: “if you love radio, give digital”. In a recent report media regulator Ofcom called the UK a “Digital Radio Nation” as it leads major global markets in both digital radio listening and coverage. Over 50% of radio listeners listen on a digital platform with DAB being the most popular. Nearly 50% of UK homes now have a DAB digital radio. All the digital platforms (DAB, online and DTV) now account for 37.8% of digital listening hours. DAB radios are now being fitted into 60% of new car registrations with 1.3 million cars with digital radio fitted being sold in the last year. Source: GfK November (cumulative digital radio sales including DAB radios and FM/IP radios)/ Rajar Q3 2014.